We strive to deliver luxurious custom homes that our customers can proudly call home. Born and raised in Las Cruces, Bob Flamm, owner and general contractor for Enchanted Desert Homes, offers valuable skills and insights to your home building experience. 1. He brings insight and knowledge of the Las Cruces area to help his customers choose the right home site and home design. 2. He works to ensure customer satisfaction through close interaction with his clients, and by engaging them with all personnel involved in the building process. 3. Bob specializes in custom wood designs, and brings you beautiful vigas, wooden doors, custom made cabinets and exquisite wood features that can be as intricate and ornate as you desire. Enchanted Desert Homes is a family business, and we are committed to Las Cruces and its wonderful people. Bob's wife, Debbie, handles all company bookkeeping. Working in the business together has been very beneficial and rewarding. Bob thoroughly enjoys working with people and is devoted to developing one of kind custom designs for his customers, and for the community that he lives in. 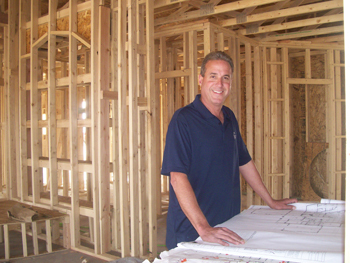 Bob has been a part of the Las Cruces home building community his entire professional life. After obtaining a degree in Business from New Mexico State University, Bob began building quality, custom designed homes. Over the years Bob's skills have been enhanced by each and every home he has built. If you are looking for a quality and experienced home builder, we hope you will consider working with Enchanted Desert Homes.